Pennsylvania Governor Ed Rendell has signed Senate Bill 100 creating a new law that will require home improvement contractors to register with the State Attorney General's Office by July 1, 2009. Contractors doing more than $5,000. home improvement work annually will receive a registration number that must be displayed and provided to potential customers. Networking: Network with others in your industry at the Pocono Builders Association’s monthly membership dinners. Membership Dinner are held the 2nd Wednesday of every month. 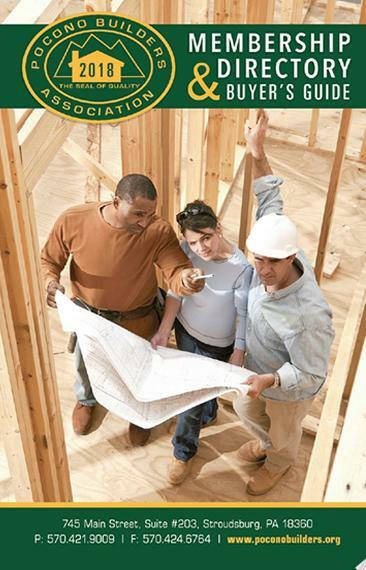 Membership directory, and web site: Complimentary copies of the Pocono Builders Association’s membership directory are sent to consumers who call the Association looking for a contractor or service provider. The guide includes a classified section in the back which breaks down the membership by specialty (roofing, siding, etc). This information is also included on the Associations Web site www.poconobuilders.org and is updated monthly. Three Memberships in One: Your membership with the Pocono Builders Association also includes membership to the Pennsylvania Builders Association (PBA) and the National Association of Home Builders (NAHB). Government representation at all levels! Sensible government relations and reasonable legislation can work for the benefit of the building industry. Staying involved in the legislative process ensures that the voice of the building industry is heard at all levels – local, state and national. Seminars: The Pocono Builders Association offers numerous educational seminars for a nominal fee. Recent programs have included OSHA Complaince, Green Building, Selling to Builders and Residential Fire Sprinklers. Awards Program: New members who joined The Pocono Builders Association are eligible to participate in the Association Building Awards Program that is presented in October every year. Electronic Newsletter: Monthly publication that is emailed . This publication is a great way to keep current on industry news. Annual Home Show: Members receive a reduced rate to participate in our Annual Home Show in the spring. Free PA One Call: As a member, you are entitled to Free PA One Call. Just fax your PA One Call invoice to 570-424-6764. $125 Savings a Year! Lowe’s - Visit www.LowesForPros.com/NAHB or call 877.435.2440 and register to save 2% on your Lowe’s Accounts Receivable purchases. Plus, get free delivery on purchases of $500 or more.